With a 4-pole super switch you can have hum canceling in every position even with an RW/RP middle pickup. There is a diagram in the ilitch site showing this configuration. I have tried what ripdivot did (on page 1 of this thread), which is basically what bassetrox (on page 2) outlined. I use a set of microcoils in my strat, which are the finest pickups I ever had. They are non -RWRP, just like original Strat pickups. They are not made to particularly cancel noise, but have very high, clear output, which makes it better. But there was room for improvement, so tried the method described. After some experimentation yet to come I will put up a series of photos and publish them here. I used core of pcb material (epoxy coated glass fibre about 2mm) with two outer covers made from Pertinax 1mm each. I did not have slim size expoxy but the Pertinax seems quite stable in the sandwich. The bobbin slot therefore is 2mm x 15mm overhead. Using 0.15mm wire (which would be equivalent to AWG 7) allows for 500 turns of wire. I did, however, decide to use less. 350 turn results in a 150 Ohms resistance. I had much thinner wire available, but we suspected that the winding machine (for transformers) would not be able to handle such thin wire. The inductance would be negligible compared to the real pickup. I for stock parallel operation, the guitar is now dead silent. You can sit on top of a tube amp combo and hear - silence. This is very remarkable. I can detect no microphonics issues, but I will pot the coil later. The circuit described in the patent does something, but I am not sure what. The series cap does some noise-shaping. The remaining buzz sounds different. You´ll know immediately, if the coil is in the right way or not, if noise does not decrease. Using the super-strat-switching (three toggles) allows me to dial in any serial and parallel combination I imagine. So single, parallel2 and parallel3 all sounds dead silent, but most of the noise is back as soon as I switch to serial . I have no explanation to that yet. I can imagine that a series connection would decrease the hum-bucking somewhat, because the coil area times turns product must be in a comparable range. Double the area (two pickups in series) and double the turns means four times the resulting product. On the contrary, parallel mode makes the product smaller. Indeed I have the impression, the more pickups are in parallel, the more silent it gets. Maybe series and parallel operation would ask for a different number of windings on the cancelling coil. Tone-wise, I can indeed not hear the remotest change. The additional resistance and, much more important, inductance does not seem to be a problem. I am happy with the improvements that already are, but since the series mode with the microcoils is so useful, noise cancellation on those would be great. PS: if anybody could point out a method for tension-less feeding of delicate wire to a winding machine don´t hesitate to tell us. The BPNCS operation will not perform properly with any “in series” or “out of phase” pickup connections. I also found this guy´s web pages https://sites.google.com/site/stringsandfrets/Home/noise-reduction-for-sc-pickups who has scratched some head about this subject. There may be a solution to the serial case. For the Tele, which has a serial option (that does not cancel hum with Suhr plates) he uses individual coils for each pickup. For the Strat type G&L guitar, that seemingly uses RWRP pickups (with two hum cancelling serial positions) he uses a clever switching arrangement that disables the cancelling coil when those two postions are enabled, and thus all positions are hum cancelling. Clever. I still don't understand why a large coil embedded into a scratchplate or routed into the body of the guitar is any better than using the pre-wound bobbins of a pickup inside the existing cavities of the guitar? It's a 5 minute job and doesn't change the look of the instrument in any way. If the dummy coil (which in fact both specimen are, but the term is mostly used for an internal coil as you describe it) does not contain any magnetically conductive core of any sort, then it should not have any inductance of relevance. As Bill Lawrence puts it, its the inductance that matters for tone, which is why generally humbuckers (which have two coils in series) sound different than singles. If such a coil is wound like the coil it should help (thin wire and thousands of turns to yield a comparable area/turns product) then it will have a comparable resistance. That may alter your tone. A big dummy coil such as the suhr has only, say, 1/50th of the resistance of a single coil, so the contribution thereof to tone will be neglectible. Also, a dummy coil should ideally be as far away from the to-be-cancelled coil(s) as feasible so as both coil(-sets) do pickup far-field noise uniformly, but not signal from the strings. The absence of magnets and iron helps this. Humbuckers do pickup both to an extent which is another reason why they are a compromise. Remote dummy coils will be pretty far away (by matters of magnetic "window") from the strings that they would pick up neglectible signal. Of course, they must be in the same plane to be subjected to the same noise flux. That´s the only reasons I can find. If somebody has experience with both types I would be glad to hear about it. Thanks for the explanation, perhaps I'll experiment with both on my other guitar (which suffers from single-coil hum). I haven't noticed much tone difference with the dummy coils personally but would be keen to try the two different methods when I get time. After some days of experience (yes, Jimi I have seen you there...) and bypassing and listening and... I can still not detect any influence of that coil on tone. I measured 30mH, which is totally insignificant compared to the about 2 Henries of the pickup itself. I managed to pinpoint and solve the serial problem. A writeup on my web pages is on its way. I´ll let you know. 2: what type of coil string should i use for best result, metal, thickness ? It seems to have been simplified to just 2 volume pots ? I don't think it will work as well on the small round back plate. The idea is to use as large of a surface as possible. You are trying to pick up as much or more hum than the noisy coil in your guitar. The larger the dummy coil the less wire you will need and therefore you minimize the effect the dummy coil has on your original tone. You will need a lot more turns on your coil on the round back plate to get the hum canceling working right and this will more than likely change your tone. Ripdivot wrote: I don't think it will work as well on the small round back plate. The idea is to use as large of a surface as possible. You are trying to pick up as much or more hum than the noisy coil in your guitar. The larger the dummy coil the less wire you will need and therefore you minimize the effect the dummy coil has on your original tone. You will need a lot more turns on your coil on the round back plate to get the hum canceling working right and this will more than likely change your tone. For those wishing to understand how it works,,,, The above is a very good simple explanation. P90s have a lot of wire in them, so they need as large a cancelling coil as any single-coil you are likely to encounter. The fact that it is only one pickup doesn't make much difference to what you need either - pickups are usually selected in parallel, which gives (pretty much) the average of the signal and noise of the pickups selected - if the pickups have the same noise level, the noise won't really change a lot when selecting more than one. I have a Strat with two standard Fender single coils and a DiMarzio FS1 (a bit like a P90 coil but in a taller narrower format) in the bridge. My home-made noise cancelling coil is the size of the Suhr/Illich ones and has about 680 turns of wire on it (I think - it has been a few years since I made it) and it cancels the noise of the standard pickups fine whether one or both are selected, it nearly cleans up the mid/bridge combo, and the FS1 on its own is noticeably noisy but much better than stock. Any particular reason you made so many windings ? any take on the direction of the windings ? does it matter ? The direction of the windings are not important. 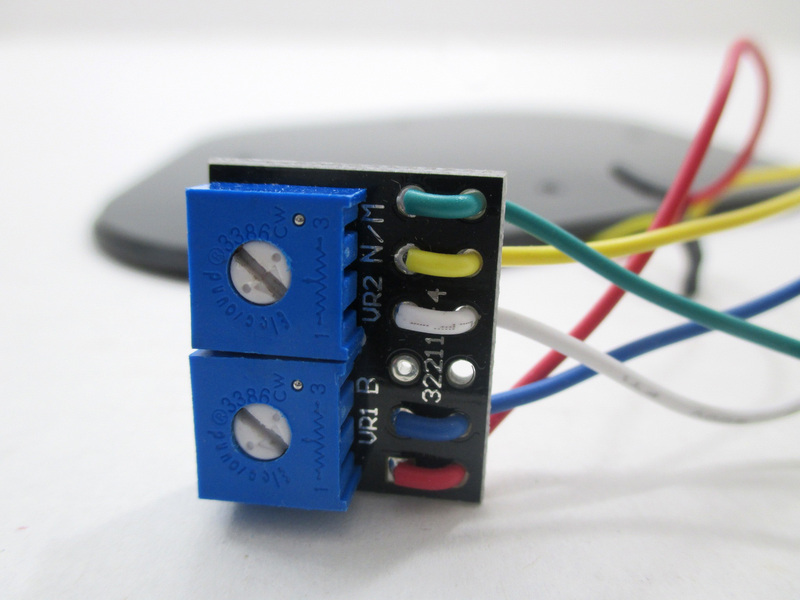 If you are not getting any hum canceling you just need to reverse the dummy coil leads. I bought one from iLitch http://www.ilitchelectronics.com/strat-bpncs-3/ the POW model for my over wound strat pu's. Looking at the patent diagram mine has no cap fig 22 that leg connects to ground. Also there is no R fig 21, R fig 19 is 10k and the adjustment pots are bolth 10k. The coil resistance is 460 ohms 36AWG. It works great once I got the large coil wired in the right direction. Adjusting the pots you'll find a null setting for max hum reduction and it will increase either side of that spot. I'm going to make a one for another guitar. The trick as I see it is to wind as flat as a rectangular coil as you can. The thickness is ~ 1.25mm and about 11mm wide. I'm going to make a sandwich form from plastic and varnish the wire as it's wound. Then rout a channel in an oversized backplate.